Last week afforded me the opportunity to spend the week at the National Library of Ireland continuing my research on the everyday lives of Irishwomen. 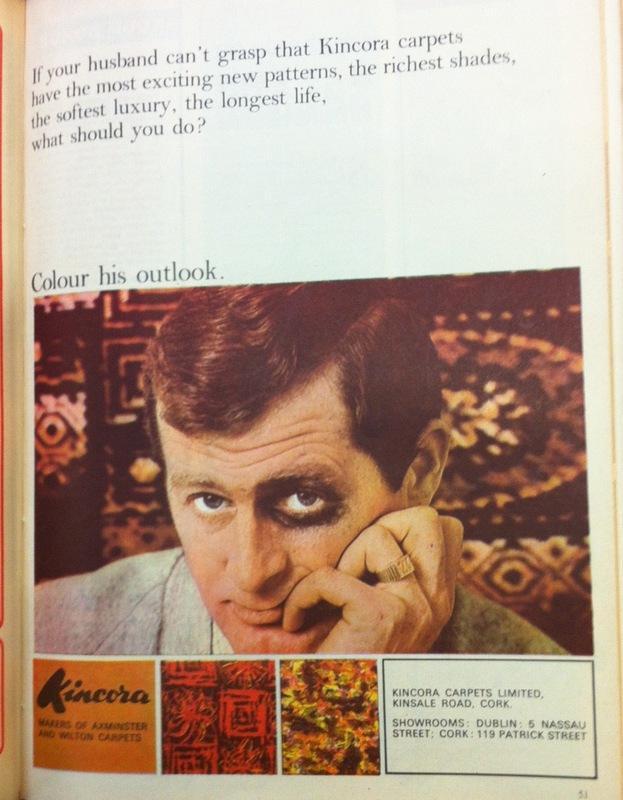 I was working my way through copies of Woman’s Way magazine from the mid-1960s when I discovered somewhat unsettling advertisements for Kincora Carpets. The advertisements recognised the fact that women were the domestic purse-holders and main decorators/designers of home interiors, but also acknowledged that they might not always have the final say. Placing the woman is a position of power, they advocated that she assert herself in favour of Kincora Carpets, which boasted ‘the most exciting new patterns, the richest shades, the softest luxury, the longest life’. If her husband should disagree, the advert asked, ‘what should you do?’. By today’s advertising standards, the suggestion is startling In addition to the advert below, which shows the husband with a black eye, another features the husband with his head pressed against the presumably soft carpet, a woman’s hand forcing him down. These ads appeared frequently throughout 1966 and, in both instances, the very visual images prove more effective than any written word. Woman’s Way, second fortnight in May 1966. Though the management at Kincora Carpets (or the advertising company behind the campaign) were hardly supporters of domestic abuse, the adverts do make light of the matter. As domestic violence was generally still seen in the 1960s as a private issue to be resolved within the family and behind closed doors, it is intriguing to find the subject not just hinted at, but actually featuring in an ad campaign, albeit in a comical way. Furthermore, these adverts were appearing at a time when emerging second wave feminism was starting to bring some previously taboo issues — including domestic violence — into the public arena. I’d be intrigued to know how the ads were received at the time. Updated (23.49, 27 July 2014): Bronwyn Labrum made an interesting observation over on twitter that the advert might be tapping into the kind of Carry On humour of role reversal that was popular at the time. Intriguing suggestion. Will follow up. Women’s violence against their husbands has a long history of being treated as humorous. It seems to be part of the joke of the topsy-turvy world where the normal order of things are overturned. Early modernists would argue that the comic treatment is a way to neutralise the fear of women rejecting their subordinate role in society. Also, in the 19th century there are loads of cartoons – e.g. Punch – where the wife is the dominant partner in marriage, often using violence. Again this seems to be a cultural working-through of challenges to gender ideals. Maybe the same thing was happening with this ad? Joanne, this longer historical perspective is really useful. Thank you! Is there any introductory reading you can recommend so that I can learn a bit more?